Upon visiting Australia, Oprah Winfrey proclaimed to the locals in Sydney, “You’re so darned friendly, you must go to friendly class!” If Oprah says it, it must be true! And now Monograms makes it easy for you to experience this friendliness yourself! On this 10-day Australia vacation, we’ve arranged your hotel reservations, daily breakfast, sightseeing, and private transfers to/from the airports from/to your hotels for your intra-vacation flights. Plus, a one-of-a-kind feature: the Monograms Local Host®, someone who is there throughout your stay (in Sydney and Melbourne) to ensure your vacation runs smoothly and to help you make the most of your vacation. Your vacation begins the moment you arrive. Monograms can pick you up at the airport and whisk you seamlessly to your selected hotel. Your Local Host will greet you with a smile and materials to help you get settled. The next day, after your included breakfast, we’ll pick you up at your hotel for a guided sightseeing tour with a local expert. You’ll hear inside stories behind the must-see sights, like the Opera House and Bondi Beach. And never fear…we’ve scouted the city for the best place to capture a photo of Sydney’s famous Harbour Bridge. In Melbourne, your guided sightseeing with an expert Local Guide includes the Royal Botanic Gardens and Queen Victoria Market. On the third day in each city, you have a free day to explore on your own (with your Local Host support, of course). You may want to follow in Oprah’s footsteps and climb to the top of Sydney Harbour Bridge; explore the cobblestone streets of the Rocks, the harborside area where the first convicts settled; or participate in a game of lawn bowling. In Melbourne, visit one of Australia’s leading opal companies or take an excursion to see the little penguins emerge from the sea and waddle across the beach in the world-famous Penguin Parade. It’s not just the cities you’ll experience on this Australia vacation. In Port Douglas, we’ll take you to the Outer Great Barrier, where you can snorkel, take a semi-submersible watercraft tour, or attend a presentation by a marine biologist. You’ll be amazed by the clarity of the water and the variety of fish that will swim all around you. You may even see a green sea turtle glide by! In your vacation package, we’ve included a catamaran cruise to the Outer Great Barrier Reef. You will also have a day at leisure so perhaps take an excursion via the Kuranda Scenic Railway to the quiet mountain village of Kuranda, or explore one of the markets to try locally grown mangoes and bananas. 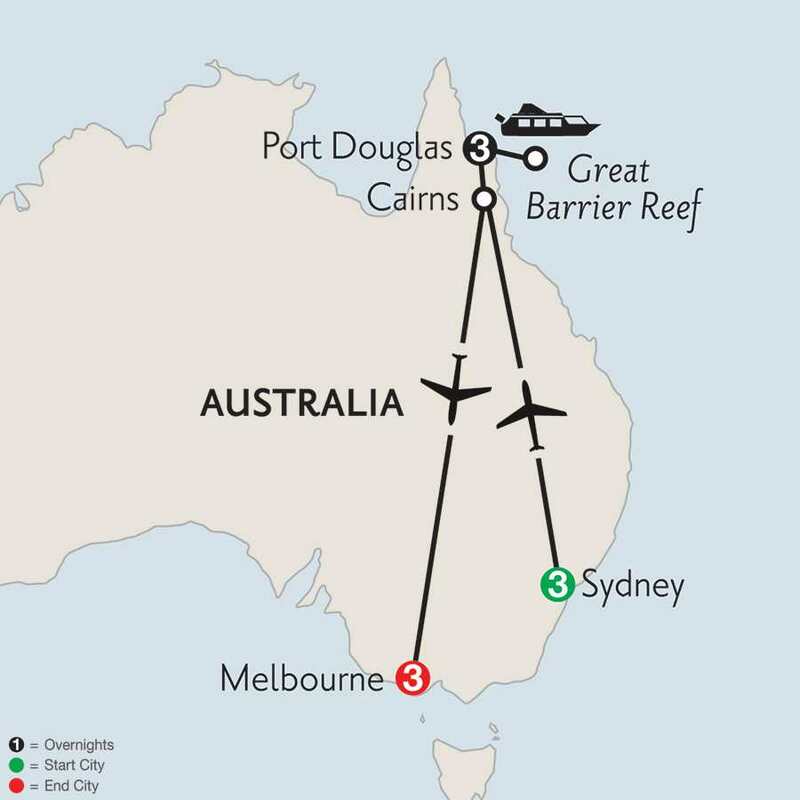 Fly to Cairns, “Gateway to the Great Barrier Reef,” one of the Seven Natural Wonders of the World. The balance of the day is at your leisure. A full day at leisure. You may wish to take a trip into the Daintree Forest, the world’s oldest living rainforest, and to beautiful Cape Tribulation. Other activities include hiking, relaxing by your resort’s pool, or window shopping at the unique boutiques and art galleries in downtown Port Douglas, where you are sure to find a favorite souvenir. Your morning guided sightseeing tour includes Federation Square, St. Patrick’s Park, Queen Victoria Market (when open), the Italian Quarter, the Shrine of Remembrance, and St. Kilda Beach. Your tour ends at the EUREKA SKYDECK for awe-inspiring views of Melbourne from the Southern Hemisphere’s highest viewing platform. The remainder of the day is at your leisure.